When it comes to a highly affordable notebook that you can bring around without hurting your back, at the same time to have it do all the basic computing stuff that you need such as checking up your email, to post photos on Facebook, as well as to update your blog, then the Acer C720 Chromebook might be just the thing for you. With this particular Acer C720 Chromebook, one is able to enjoy fast and responsive performance, not to mention up to 8.5 hours of long battery life thanks to the inclusion of an Intel processor that is based on the new Haswell micro-architecture. The Acer C720 Chromebook would sport a new design which is 30% thinner than before, while your eyes will definitely appreciate the anti-glare 11.6″ ComfyView display at 1,366 x 768 resolution which is said to reduce reflection in order to deliver a better visual experience for the end user. Not only that, when you want to get cracking right there and then, you do not need to worry about stuff like long boot up times, since the Acer C720 Chromebook boasts of a boot time that is less than 7 seconds. Right now, those who are interested in picking up the Acer C720 Chromebook will be able to place a pre-order over at Amazon.com and BestBuy.com for $249.99 a pop, where it will arrive with 4GB of RAM. 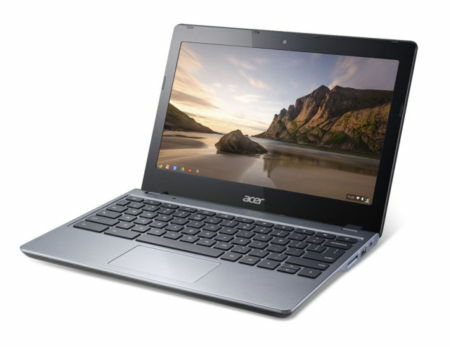 This third generation Chromebook will continue from where the hugely popular Acer C710 Chromebook left off, integrating Google’s Chrome operating system. Other hardware specifications of the Acer C720 Chromebook include Wi-Fi connectivity, up to 100GB of free Google Drive storage for the first two years after making your purchase, the ability to access files offline, as well as a Kensington lock that gives you peace of mind as you secure it to a classroom table or mobile cart. Local storage space on the Acer C720 Chromebook stands at a 16GB SSD.